Cabinet photo that needs further research and a bit of luck. Perhaps you can help me fill in the blanks. As you can see, there are 3 clues associated with this photo. 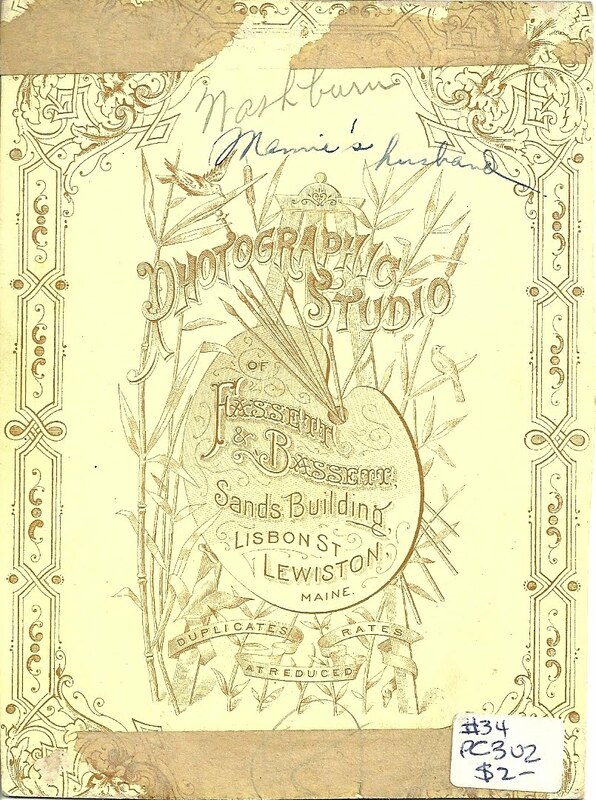 It was taken by the Fassett & Bassett Studio of Lewiston, Maine. 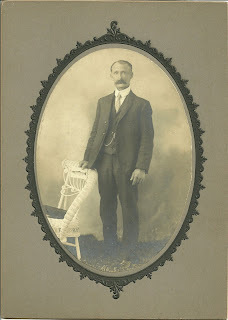 The man is identified as "Mamie's husband". 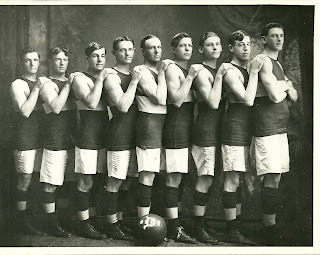 The surname or perhaps, town, of "Washburn" is written above "Mamie's husband". 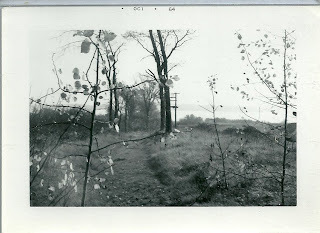 Researching online, I found several Washburn possibilities in the Androscroggin County area. I also found a Mamie married to a Ralph Washburn, in the 1920 Census for the town of Reed in Aroostook County, Maine and a Mamie who was born a Washburn, the daughter of George and Lula in Presque Isle, Maine. 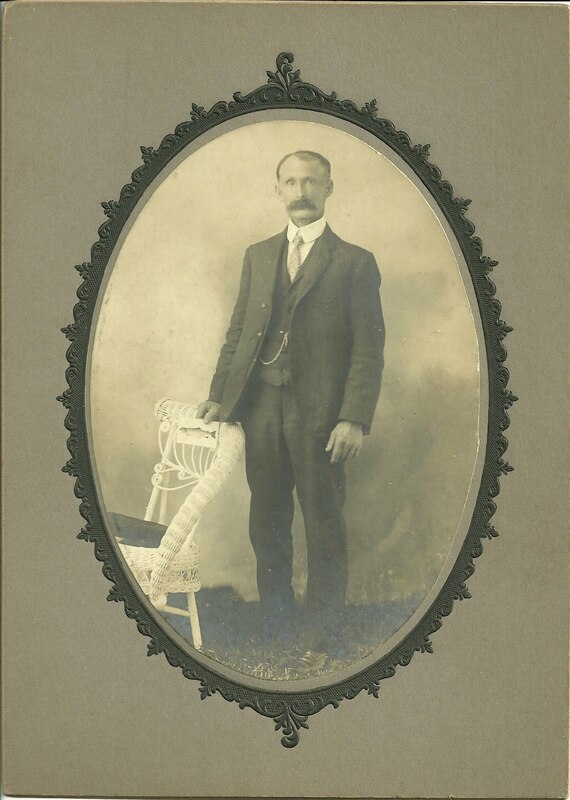 My hope is that someone will see this photo and recognize this man from family photographs or genealogy research and contact me. 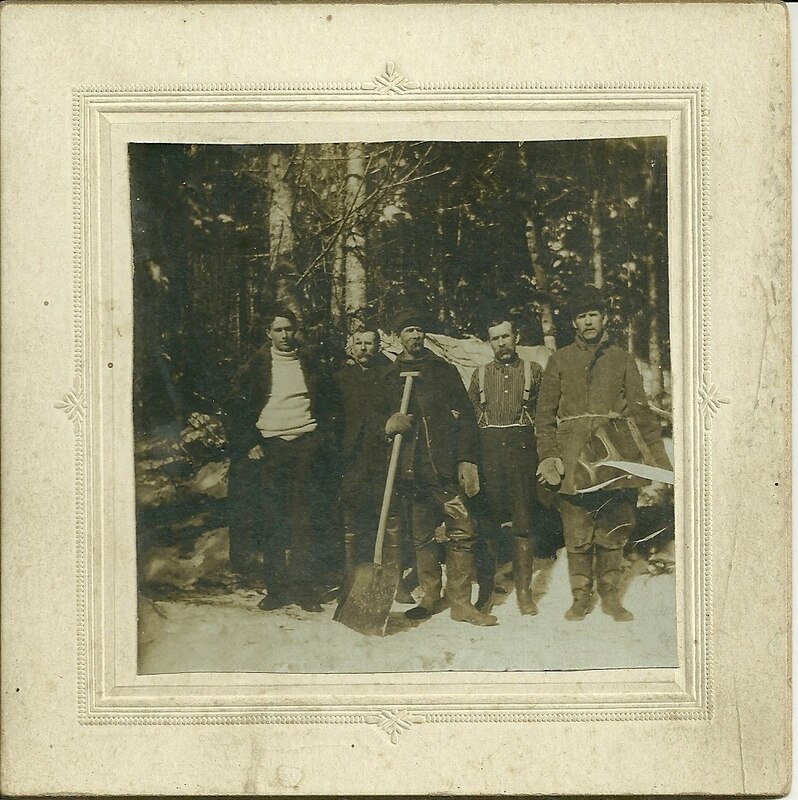 I purchased this photograph with another that showed the long-gone DeMonts Hotel in the Red Beach area of Calais, Maine. 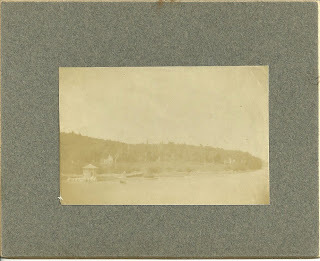 I was told that this was probably a view of Devil's Head, a high headland along the St. Croix River, but I can't guarantee that. There are other areas in Maine that would could fit the bill, including several on Mount Desert Island, partial home of Acadia National Park. But I'd rather think this is Devil's Head, which stands 340 feet above the river. If so, it's possible that Samuel de Champlain himself might have stood on the same cliff, which would overlook the settlement he attempted in 1604 on St. Croix Island. Some say that the name Devil's Head is derived from Sieur D'Orville, who accompanied Champlain on his expedition, but I've heard a couple other explanations as well. Devil's Head has been preserved and has a network of hiking trails. 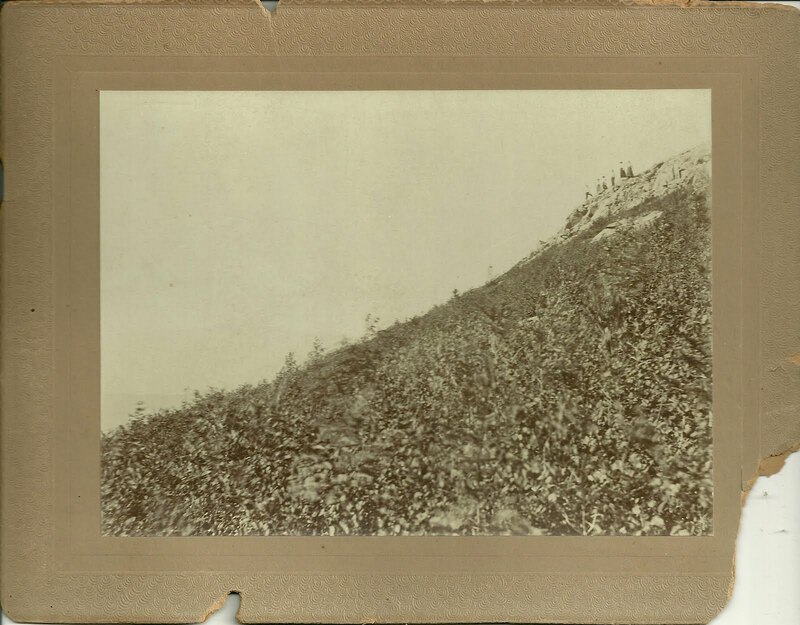 Old photograph of what I am told was the DeMonts Hotel in Calais, Maine, which was located in the area of Devil's Head and Red Beach. There's a companion photograph, a larger one, showing people standing atop a precipice, probably Devil's Head, a dramatic headland on the St. Croix River. I could find very little about the DeMonts hotel online, but it seems likely that it was named after Pierre DuGua, Sieur de Mons (or DeMonts), who had explored the area with Samuel de Champlain in the early 1600s. The hotel was apparently built some time before 1897, as I found a reference in an 1897 newspaper article where John C. Bunker was planning to lease and restore it. 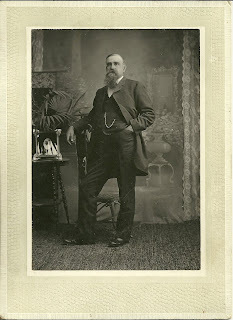 The man from whom I purchased the photograph knew that the hotel had been destroyed in a fire, but he wasn't sure when. Nearby St. Croix Island is the site of an ill-fated settlement established by explorers De Mons (or DeMonts) and Champlain in 1604. The settlement suffered from an unusually harsh winter and the effects of scurvy, with dramatic loss of life; probably more would have succumbed had it not been for the help of the Passamaquoddy tribe on the mainland. In 1605 the survivors relocated across the Baie Francaise, now known as the Bay of Fundy, to Nova Scotia, where they founded a settlement at Port Royal in the Annapolis Basin. If anyone wishes to know more about de Mons and Champlain, I heartily recommend Champlain's Dream by David Hackett Fischer. I heard the author speak at the University of Maine, where he indicated that he decided to write a biography of Champlain mainly because he and his wife summered on Mount Desert Island, also explored by de Mons and Champlain in the early 1600s. As Mr. Fischer began researching his subject, however, he realized that he had luckily chanced upon a truly fascinating man, one of incomparable skills and judgment, and a flaw or two, who had lived during a time of turbulence and intrigue and promise. Hopefully you will enjoy this memento. Thanks for stopping by! 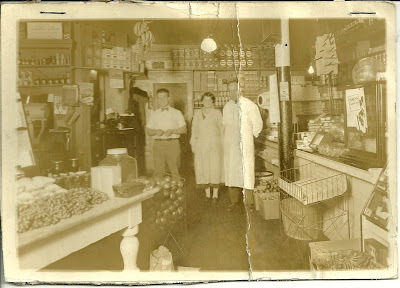 Sadly unidentified as to locale, time frame and people, but interesting for showing the range of products available. 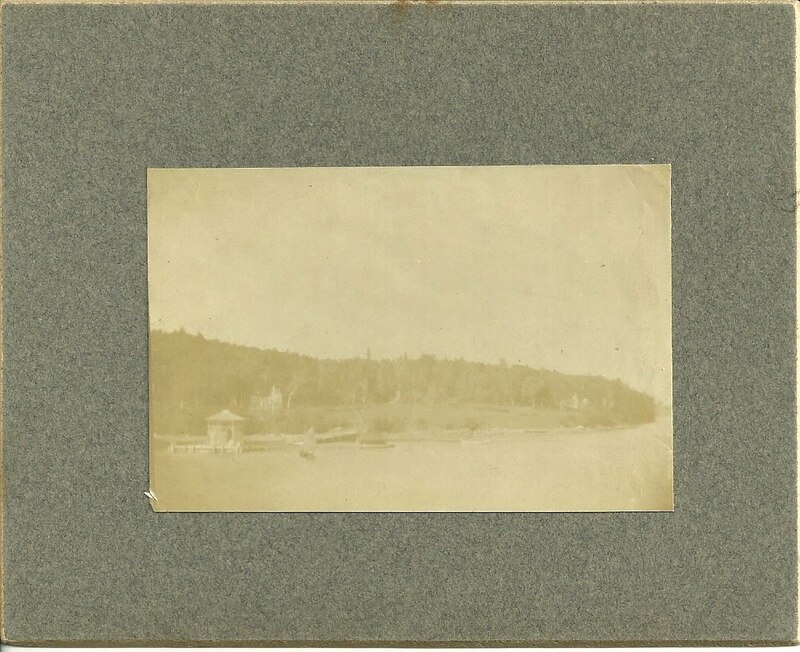 Possibly Maine. I looked for clues in the various signs and packages. 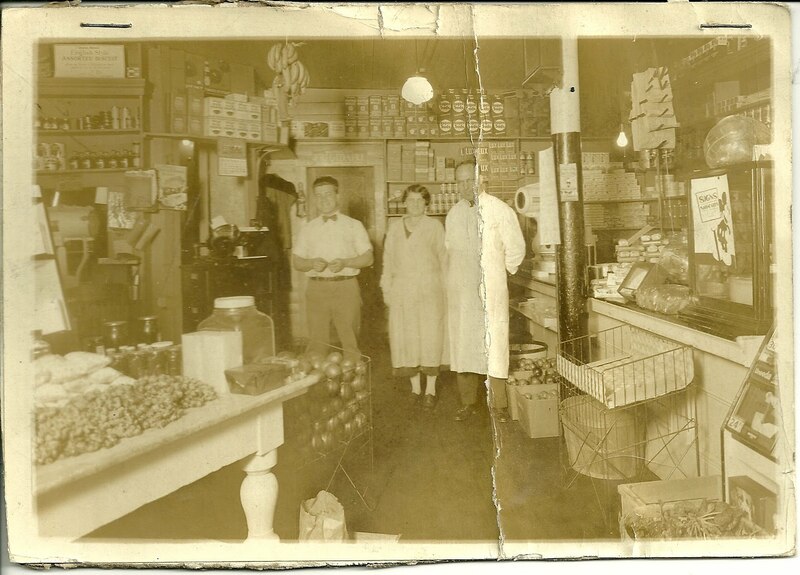 Since Frigidaire started mass production of refrigerators in the 1920s, it's possible the photograph dates to that era. The calendar might hold a clue as to locale, but I can't make it out. 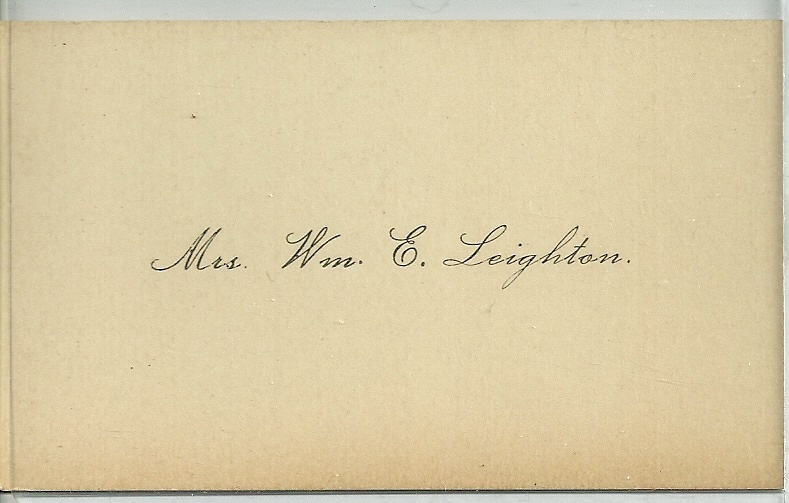 I believe this is the calling card of Mrs. William Eldon Leighton of Pembroke, Maine. 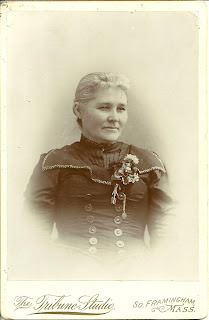 She was Josephine Maria Leavitt, born in 1843 in Pembroke, Maine, the daughter of George Washington and Theresa or Thurza Ruth (Stoddard) Leavitt. 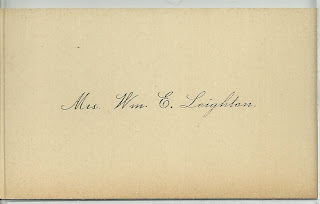 Josephine married William Eldon Leighton, who was born in 1840 in Pembroke, Maine, the son of Isaiah and Sarah (Hatch) Leighton. William Eldon Leighton commanded the local contingent that fought in the Civil War; he was thereafter known as Captain. He owned the Leighton Organ Company and made other instruments as well. One of his best known customers was Charles Best, co-inventor of insulin. Charles Best grew up in Pembroke. I wasn't able to find any offspring for William and Josephine. Hopefully this memento will have some meaning for you. Thanks for stopping by! 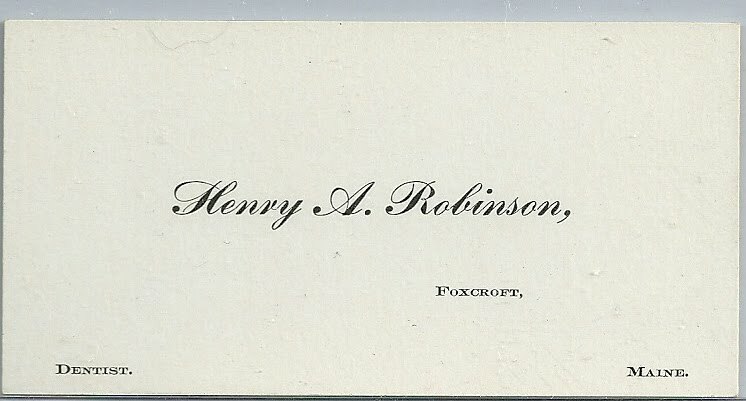 Calling card of Dr. Henry A. Robinson, Dentist, of Foxcroft, Maine. He was born in 1840 and died in 1902 after a period of ill health caused by gastric problems. 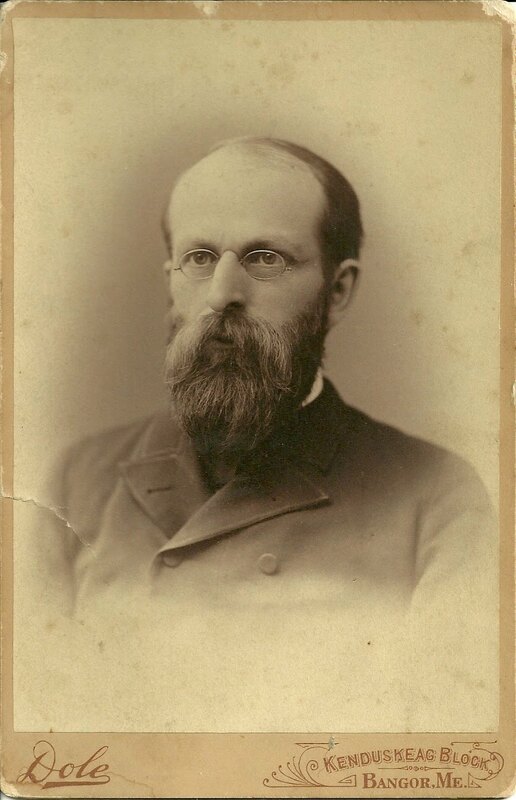 In 1860, he married Adriana M. Stacy, the daughter of Hiram Stacy. Henry and Adriana had a son Leonard and a daughter Alice. 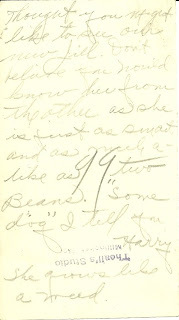 Aside from his work in dentistry, Henry was an avid pomologist and was interested in berries and plants of all types. Hopefully this memento will have some special significance for you. Thanks for stopping by! Single page, found removed from unknown magazine about the insurance industry, from about 1956 era; apparently removed by a Frank Fenderson, possibly from Maine, as there was an insurance man by that name in Calais, Maine. 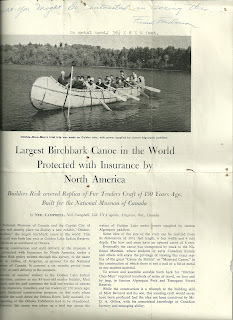 "Largest Birchbark Canoe in the World, Protected with Insurance by North America. The National Museum of Canada and the Capital City of Ottawa will shortly place on display a new exhibit, "Oitchie-Chee-Mun", the largest birchbark canoe in the world. This huge craft was built last year [from searching online, I believe the canoe was built in 1955] at Golden Lake Indian Reserve, 100 miles or so northwest of Ottawa. "During construction and until delivery at the museum it was protected with Insurance by North America, under a Builders Risk policy written through this agency, in the name of D. A. Gilles, of Arnprior, as sponsor for the National Museum of Canada. It covered a six months period from May 23, or until delivery at the museum. "Swarms of summer visitors to the Golden Lake Indian Reservation, curious to see 81-year-old master builder, Matt Bernard, and his staff construct the half ton replica of canoes used by explorers, travellers and fur traders of 150 years ago, actually hindered construction progress, so that early plans to paddle the craft down the Ottawa River, fully manned, for the opening of the Ottawa Exhibition had to be abandoned. 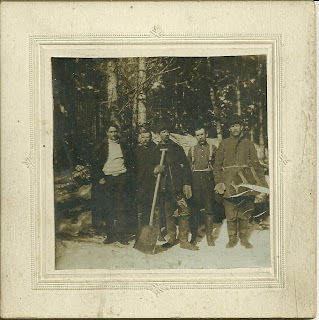 "However, the canoe was taken on a trial trip across the waters of Golden Lake under power supplied by sixteen Algonquin paddlers. "Some idea of the size of the craft can be realized from its dimensions of 36-1/2 feet length, 6 feet width and 4 feet depth. The bow and stern have an upward curve of 6 feet. "Eventually the canoe was transported by truck to the National Museum, where students of early Canadian history and others will enjoy the privilege of viewing this exact replica of the great "Canoe du Maitre" or "Montreal Canoe", in the construction of which there is not a nail or a bit of metal or any modern material. 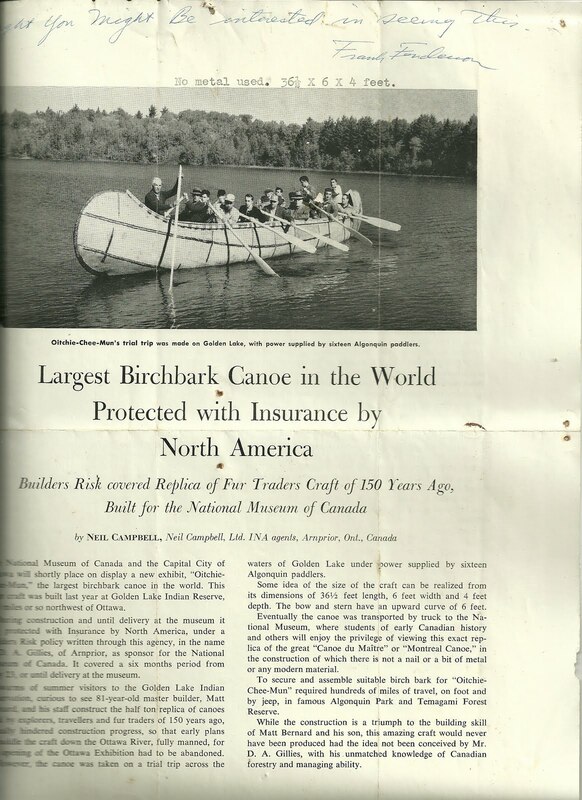 "To secure and assemble suitable birch bark for "Oitchie-Chee-Mun required hundreds of miles of travel, on foot and by jeep, in famous Algonquin Park and Temagami Forest Reserve. "While the construction is a triumph to the building skill of Matt Bernard and his son, this amazing craft would never have been produced had the idea not been conceived by Mr. D. A. Gillies, with his unmatched knowledge of Canadian forestry and managing ability." 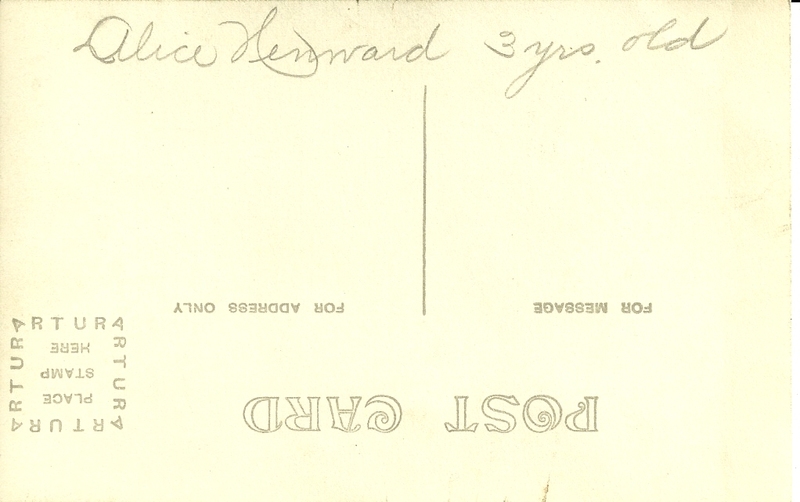 As you can see from the image, there are two additions, one in handwriting and one with a typewriter. 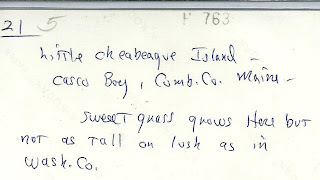 The handwriting is at top in blue pen: "Thought you might be interested in seeing this. Frank Fenderson". 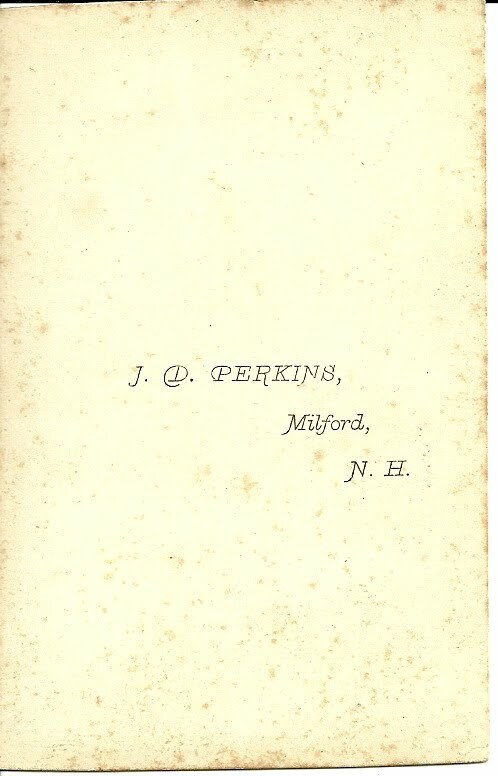 The typed portion is just above the photograph: "No metal used. 36-1/2 x 6 x 4 feet." 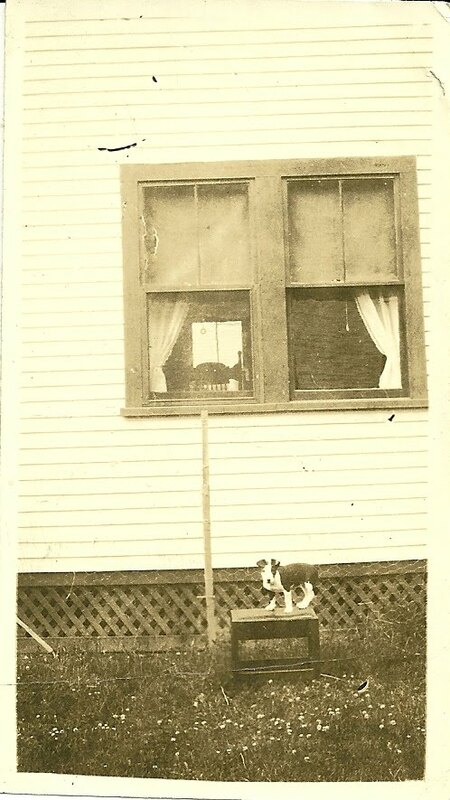 June 14, 1910 clipping, probably from a Bangor, Maine, newspaper. 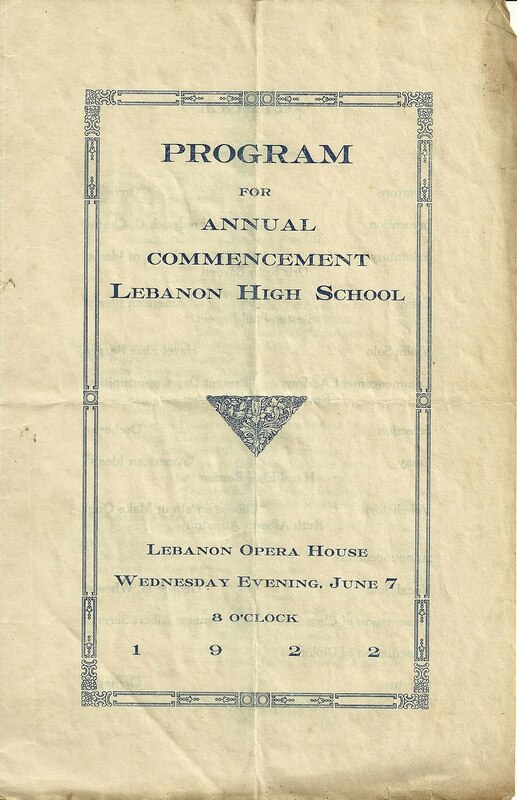 The graduation exercises of the class of 1910, Bangor High school will take place on Friday night in City Hall. The class numbers 109 and, of course, it is 'the best class that ever graduated'. The exercises will be as interesting as ever and the class upon the stage will make the same pretty picture as of yore. Parents and friends will be on hand in large numbers to listen to the fine program that will be presented. Hopefully you have found a name or names of significance. Thanks for stopping by! Islesboro, Maine, news from a newspaper with issue date of June 14, 1910, probably a Bangor, Maine, newspaper. Some of the right side of the clipping has been cut off, but I'll transcribe as best as I can. 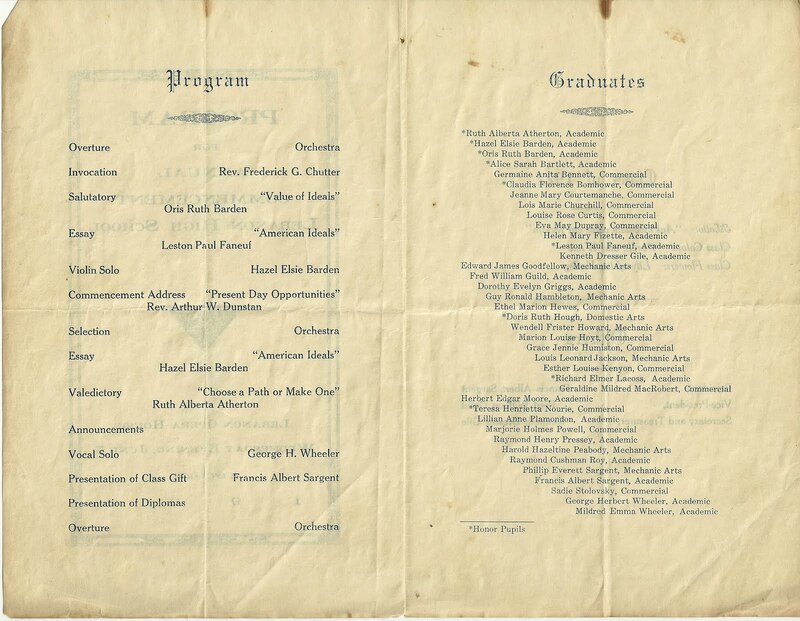 The reason the right side is jagged is that the person who clipped this was doing so for the information on the reverse, about the 1910 Graduation at Bangor High School, Bangor, Maine. [I'll be discussing that clipping in a subsequent post]. Unfortunately, the end of the Islesboro news is cut off. "ISLEBORO - June 13 - The high school closed Friday. The senior class Mark Penleton [Pendleton?] an [and] Arthur Hatch, have taken examinations for the University of Maine. Many in the junior class took part of the examinations preparatory to entering another year. Capt. 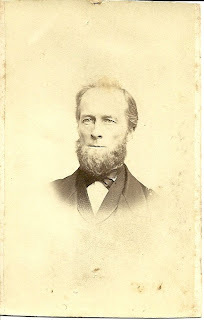 W. S. Pendleton is in New York visiting his sons for a few weeks. Capt. Walter Small is home for a few days while his vessel is unloading at Stockton. Mr. Fred Jones of Reading [Reading? ], Pa., and his family have arrived for the season. They came from Boston in their steam yacht. Miss Bessie Heseltine, assistant in the high school, leaves Wednesday for her home in Haverhill, Massachusetts. The grammar and primary grades will close the 17th for the summer vacation. Dr. and Mrs. Larrabee gave a most enjoyable party Friday evening. Mr. Newton Pendleton entertained a few friends at his home one evening last week. Harold Pendleton has returned from Portland, where he has been employed for the past two years. 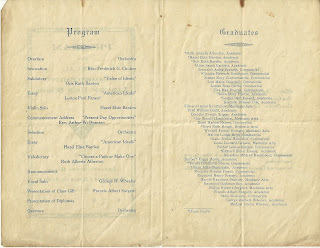 The graduation exercises of the Islesboro High school passed off well. Sunday the Baccalaureate sermon was preached by Rev. A. G. Warren of the Second Baptist Church. The house was crowded and even the gallery was filled. The sermon has been a theme for talk by all who heard it. Mr. Warner [Warner or should it be Warren? ]seemed like one inspired. 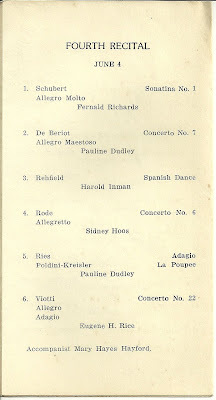 Music was furnished by the children in the lower grades. Miss Edwina P. Quincy sang a solo in a very pleasing manner. 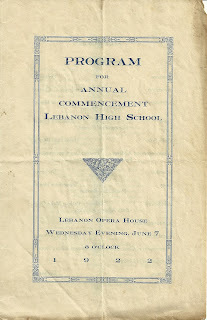 Wednesday evening came the graduation exercises and the following is the program..."
Unfortunately, here the article pertaining to Islesboro is cut off. However, it's likely that the newspaper has been microfilmed, or even digitized, and the rest of the article could be had, with a little digging. 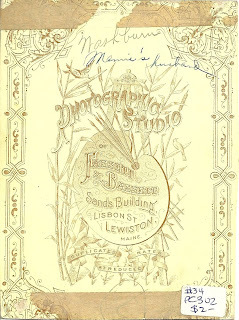 As I said above, it's likely a Bangor, Maine, newspaper, with the date of June 14, 1910. Hopefully this clipping will have some significance for you. Thanks for stopping by! 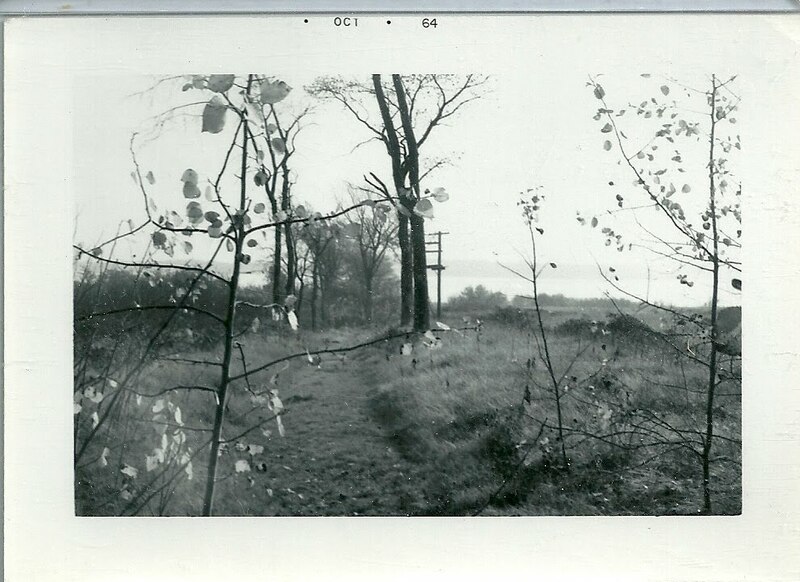 October 1964 snapshot of a path on Little Chebeague Island, which is located in Casco Bay, within the municipal limits of Cumberland, Maine. 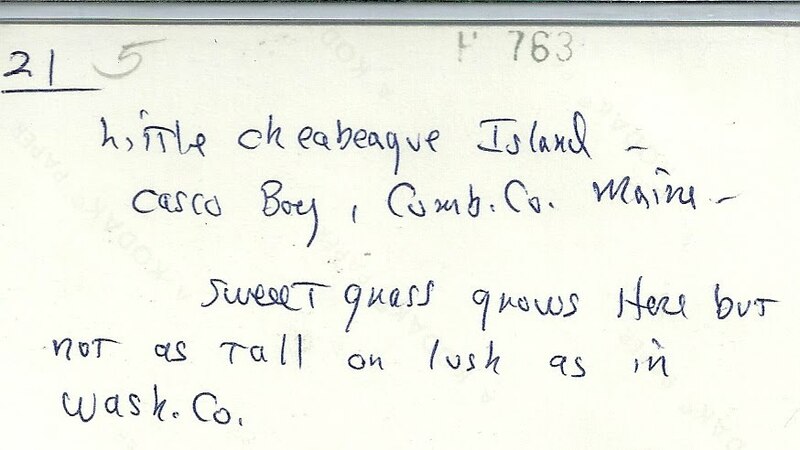 Comment on reverse mentions that sweet grass grows here, but not as tall as in Washington County, Maine. Hopefully this memento will bring fond memories to you, as it does to me. 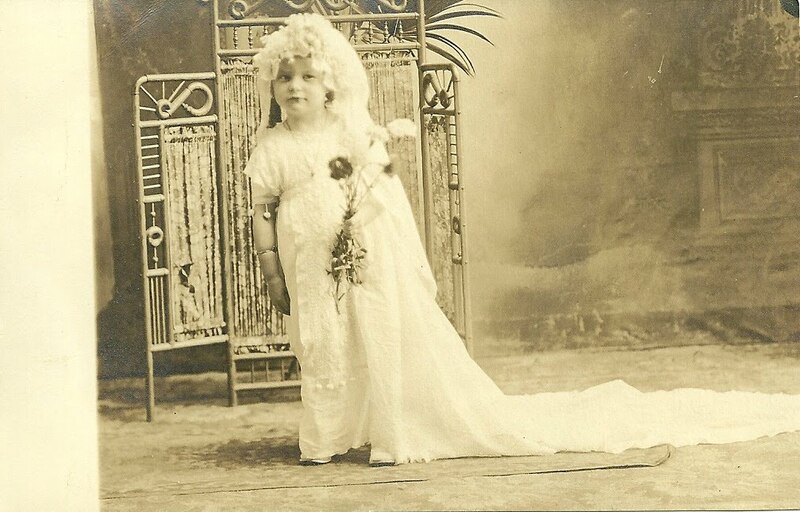 Real photo postcard of three year old Alice Henward, born about 1914, the daughter of James and Carrie M. (Lee) Henward of Eastport, Maine. 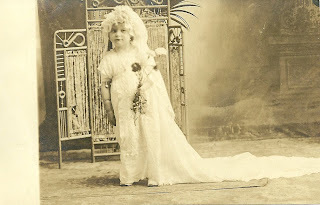 Alice was decked out in finery, perhaps for a wedding or Easter. 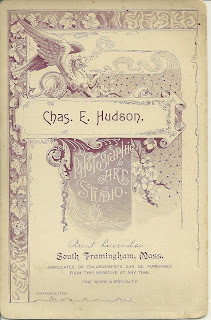 If you have any insights to share about the Henward or Lee families of eastern Maine and the Maritimes, please contact me. 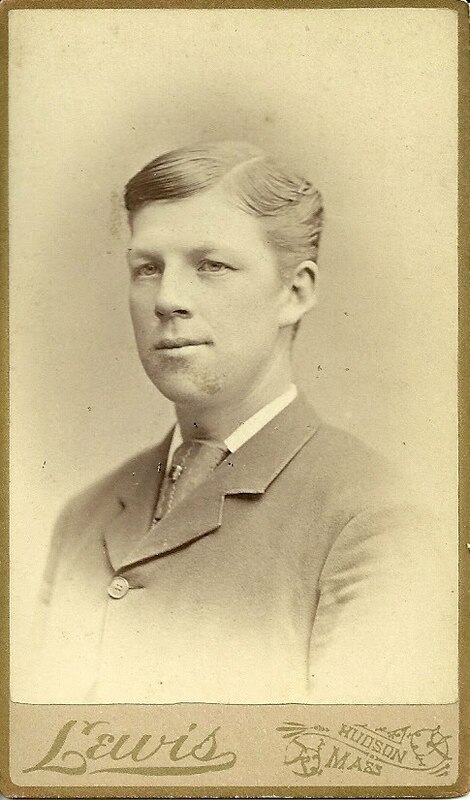 CDV of unidentified handsome young man; taken by R. B. Lewis, Hudson, Massachusetts. If you recognize this fellow from your family albums or from genealogical research you have done for someone else, please let me know. Cabinet photograph of an unidentified distinguished-appearing middle-aged man, taken by A. K. Dole, Bangor, Maine. Perhaps you recognize him from going through some old family albums or from your genealogical research for someone else. If so, please let me know. 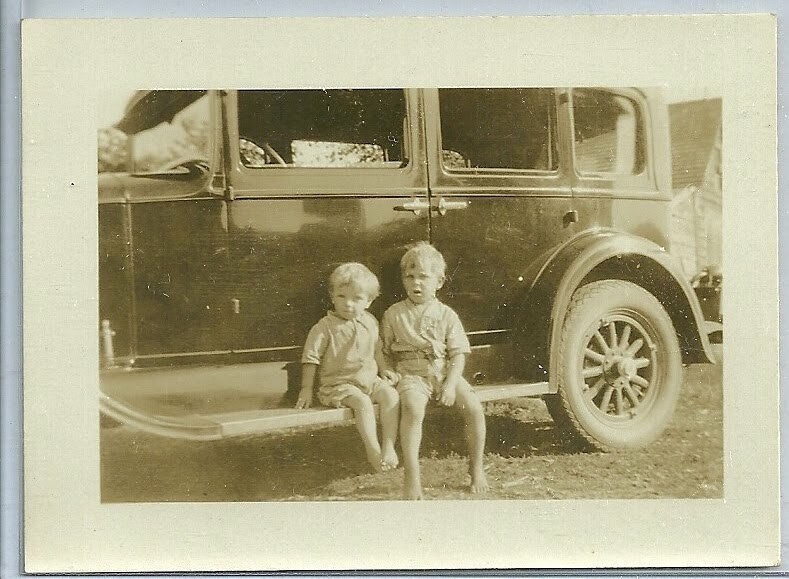 Found this old snapshot of two children, sadly unidentified, sitting on the running boards of an old vehicle that looks quite roomy. 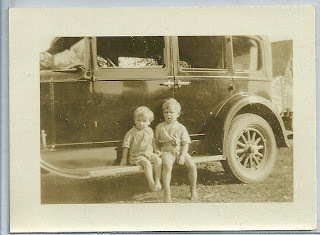 If antique autos are your thing, your may recognize the brand and model of the vehicle. 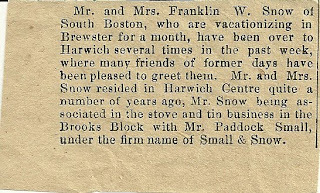 Undated, but very old newspaper clipping regarding Mr. and Mrs. Franklin W. Snow of South Boston. 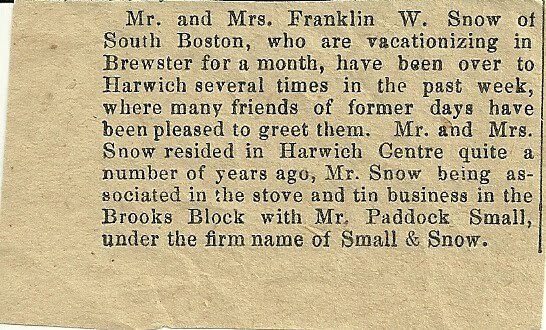 "Mr. and Mrs. Franklin W. Snow of South Boston, who are vacationing in Brewster for a month, have been over to Harwich several times in the past week, where many friends of former days have been pleased to greet them. Mr. and Mrs. Snow resided in Harwich Centre quite a number of years ago, Mr. 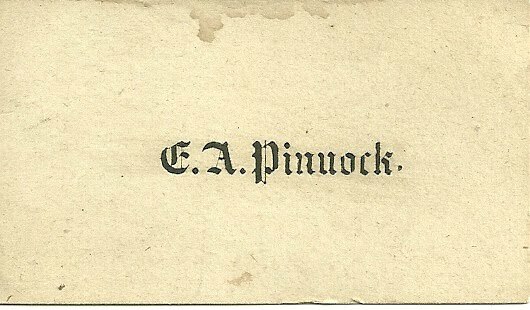 Snow being associated in the stove and tin business in the Brooks Block with Mr. Paddock Small, under the firm name Small & Snow." 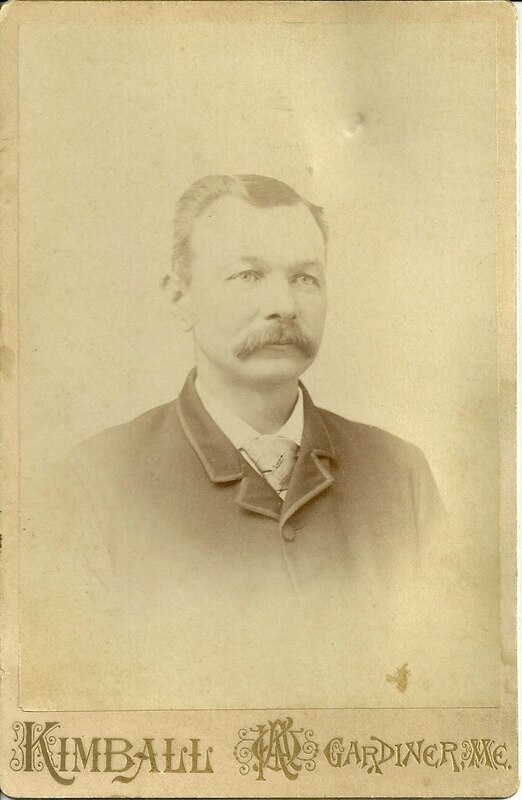 From brief online research, I think this is the Franklin W. Snow who was born about 1858, the son of Freeman & Charlotte Snow, who all show up in the 1880 Census for Brewster, Massachusetts, in Barnstable County. 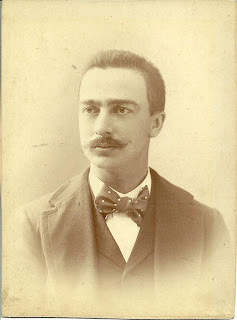 By 1910, this particular Franklin W. Snow is living in Ward 23, Boston, Massachusetts, in Suffolk County, with his wife Lizzie, mother in law Jane Newcomb and children Isaiah and Mildred. By the time of the 1920 Census, Lizzie is a widow. "Lizzie" is Elizabeth Parker Newcomb, born in 1859 in Massachusetts, the daughter of Isaish and Jane (Chase) Newcomb. 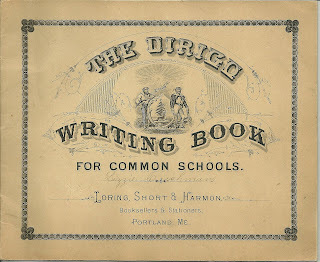 This is the fun of researching things as I blog about them. You just never know where you're going to end up. In this case, I feel as though I've told the tale of two sisters. I hope this little memento has significance for you. Thanks for stopping by! 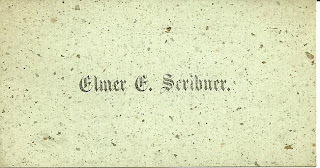 Calling card for Elmer E. Scribner. 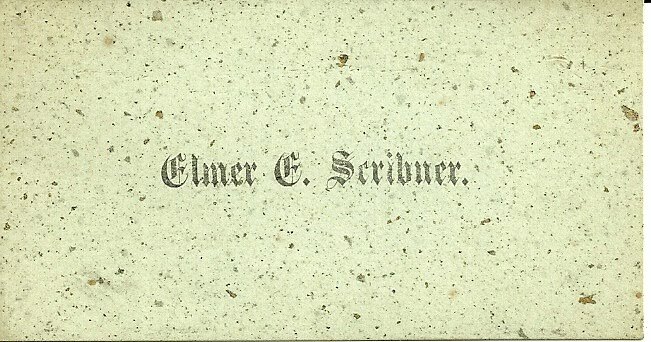 Possibly the Elmer E. Scribner who was born about 1862 in Maine, the son of James and Mary (Smith) Scribner. He shows up on the 1880 Census for Otisfield, Maine, in Cumberland Couty, as a farm laborer living with the Knight household. By the 1900 Census he has married Ida Estella, also born in Maine, and has moved to Superior, Michigan. He died before the enumeration of the 1920 Census, in which Ida describes herself as widowed. 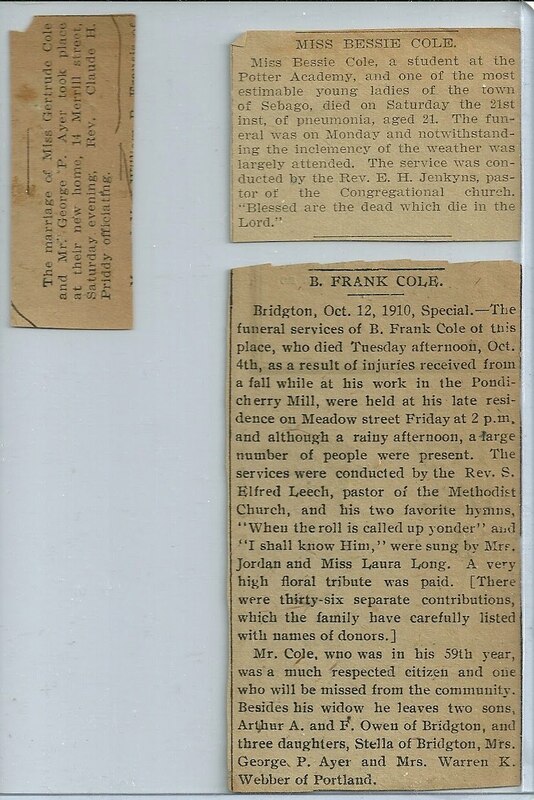 3 little tidbit newspaper clippings relating to the Cole family of Maine. I'm exploring these and their relationship to one another as I go along. 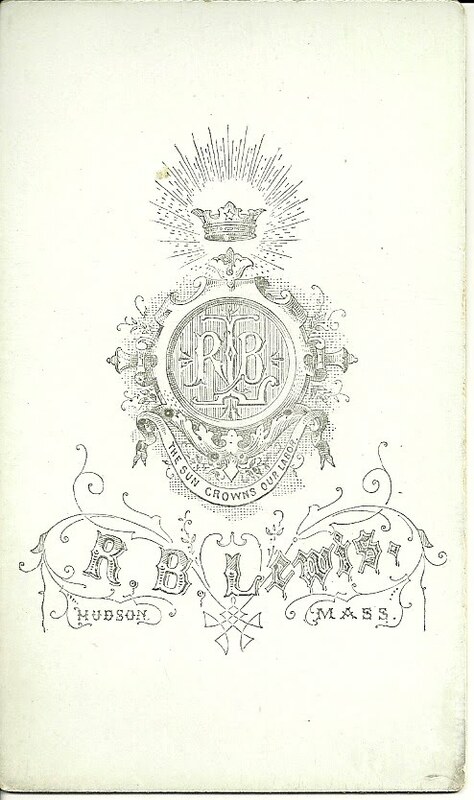 First we have a tiny scrap announcing the marriage of Miss Gertrude Cole and Mr. George P. Ayer, which I'm assuming took place in Portland, Maine, or vicinity, as Portland is the residence each gave when their marriage was recorded. Gertrude used her initials N. G., which threw me off at first. I found them when I used the groom's name. 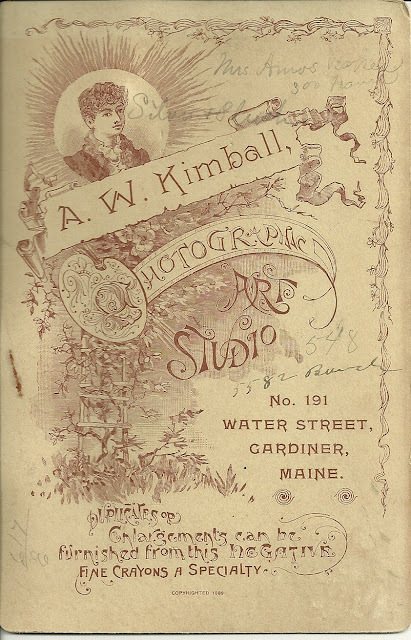 Their marriage info can be seen on the Maine Marriages online database - it took place on 20 May 1905. 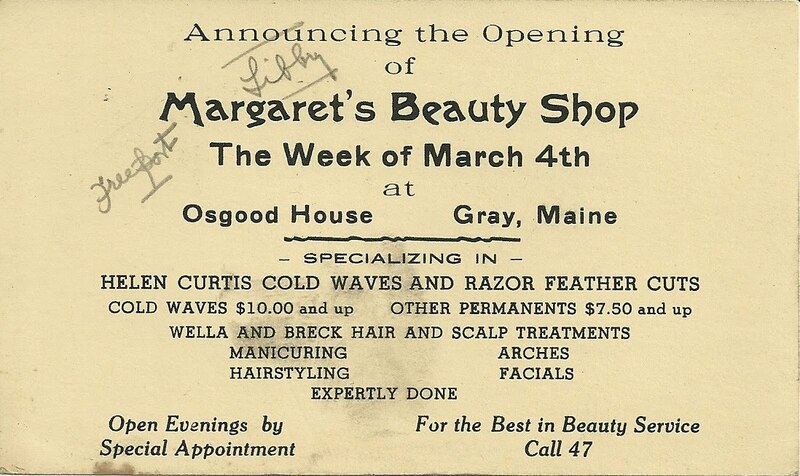 "Miss Bessie Cole, a student at the Potter Academy, and one of the most estimable young ladies of the town of Sebago, died on Saturday the 21st inst. of pneumonia, aged 21. The funeral was on Monday and notwithstanding the inclemency of the weather was largely attended. The service was conducted by the Rev. E. H. Jenkyns, pastor of the Congregational church. 'Blessed are the dead which die in the Lord'"
"Mr Cole, who was in his 59th year, was a much respected citizen and one who will be missed from the community. 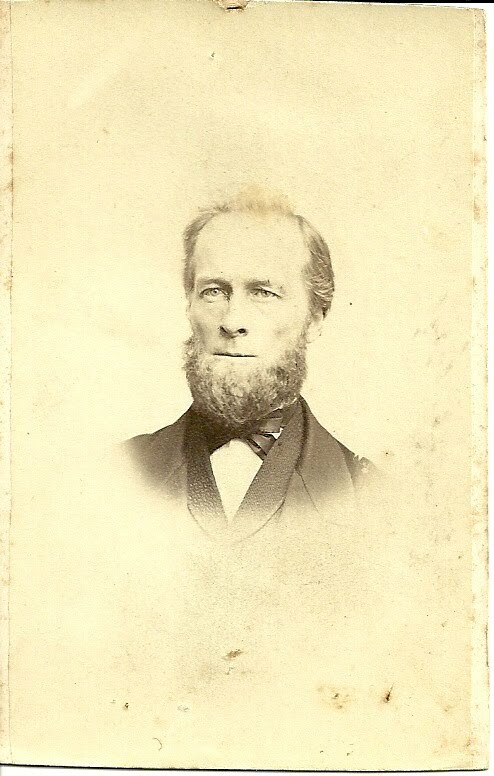 Besides his widow he leaves two sons, Arthur A. and F. Owen of Bridgton, and three daughters, Stella of Bridgton, Mrs. George P. Ayer and Mrs. Warren K. Webber of Portland." 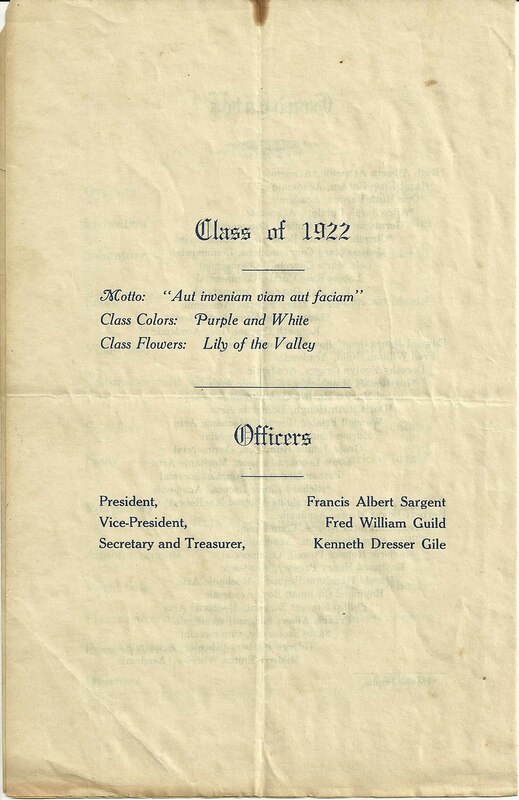 So, we now know that Gertrude was the daughter of B. Frank Cole. I found a Benjamin Frank Cole (no doubt Benjamin Franklin Cole), born about 1854 in Maine, in the 1910 Census for Bridgton, Maine; he's living with his wife Alma and sons Arthur and Owen. The Census was enumerated on April 22 and 23, 1910, so his fatal accident occurred after those dates. Further research will have to wait, as ancestry.com is undergoing maintenance today. 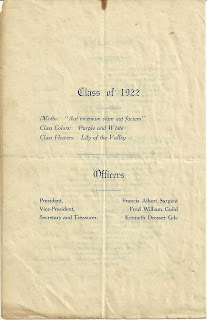 If you have any insights into the Cole family, please contact me. Thanks for stopping by! 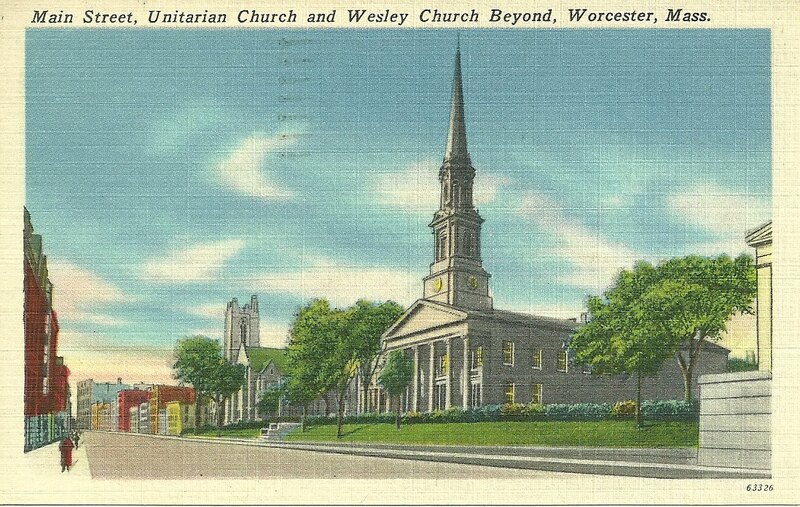 Main Street, Unitarian Church and Wesley Church Beyond, Worcester, Massachusetts. 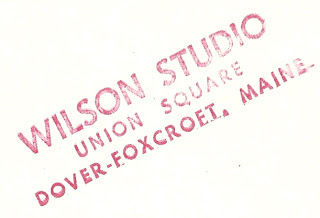 Reverse shows a postmark of February, 1953. 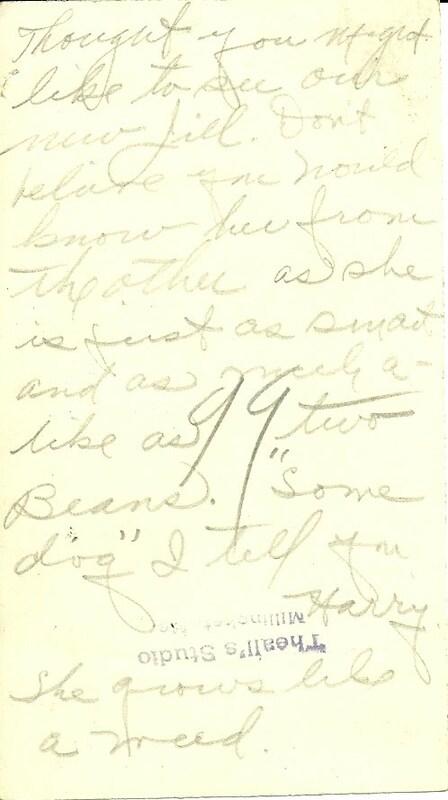 The card was addressed to Miss Myrtie Webber of St. Petersburg, Florida, and mentions the forecast of "snow - snow - and all the more snow!" 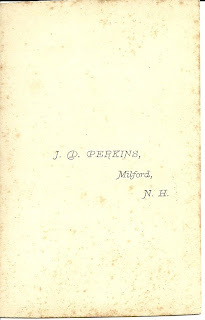 It's signed "Catherine J. J." 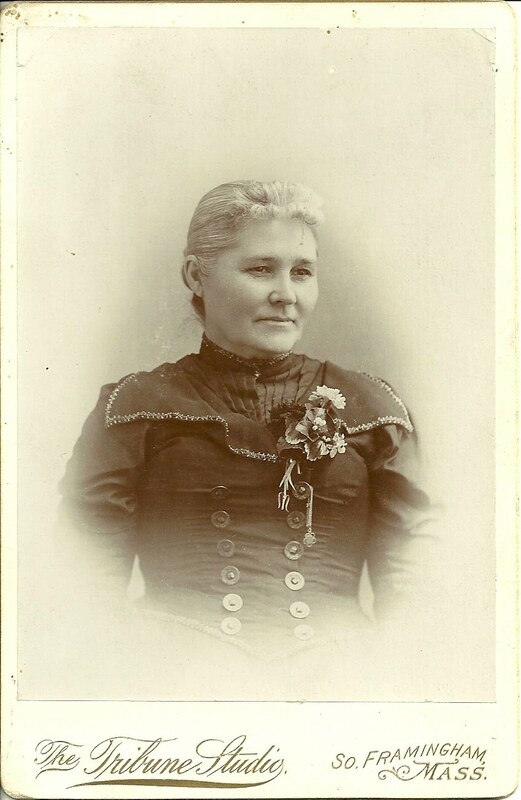 Cabinet photo of a middle aged woman identified on reverse as "Aunt Lucinda", taken by the studio of Charles E. Hudson. Just for grins and giggles, I checked the Censuses for a Lucinda of a certain age in Framingham and found quite a few possibilities. If you recognize this woman from your family albums or from research of Framingham families, please let me know. 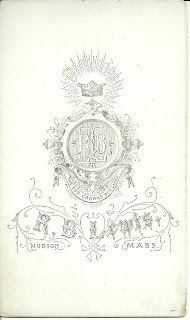 Bill and coin holder distributed by the Elliott P. Joslin Camp for Diabetic Boys, Charlton, Massachusetts. The Camp was then operated by the Association of Universalist Women, 16 Beacon Street, Boston, Massachusetts. 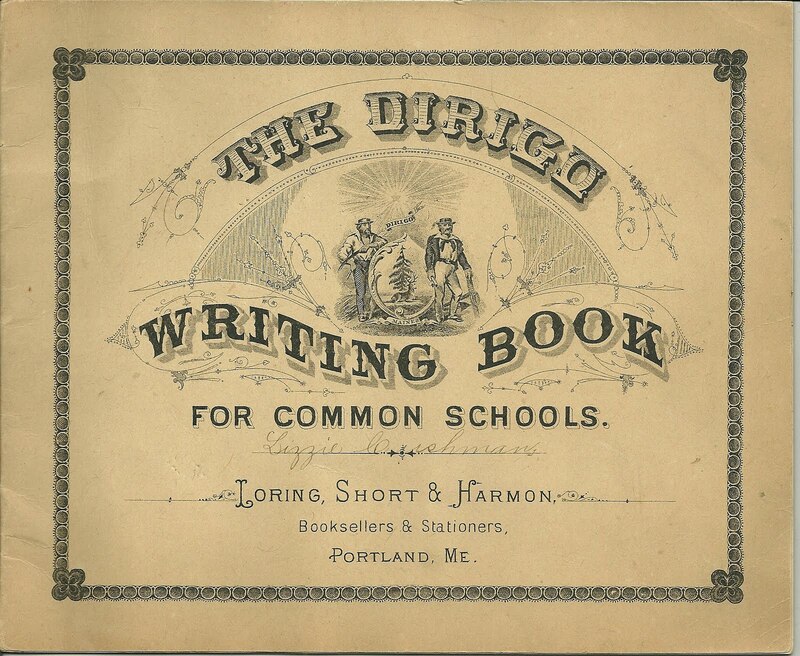 It's still in existence today as a residential camp and is now operated by the Joslin Diabetes Center of Boston. 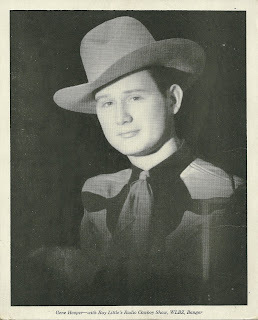 Researching online, I discovered that this camp was founded in 1948, so the memento dates from after that time. 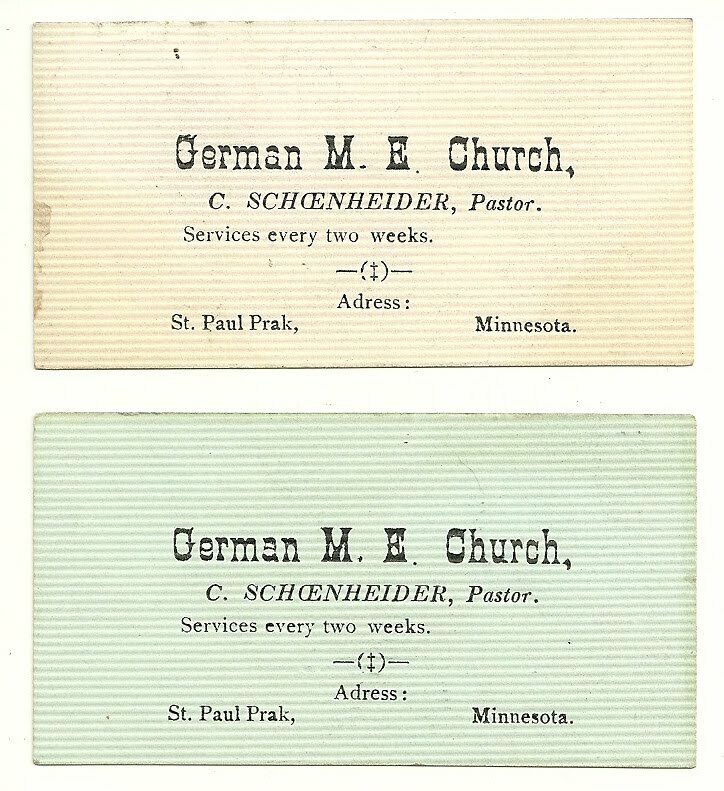 Two calling cards for C. Schoenheider, Pastor of the German Methodist Episcopal Church of St. Paul Park, Minnesota. As you can see, Park is misspelled as Prak. 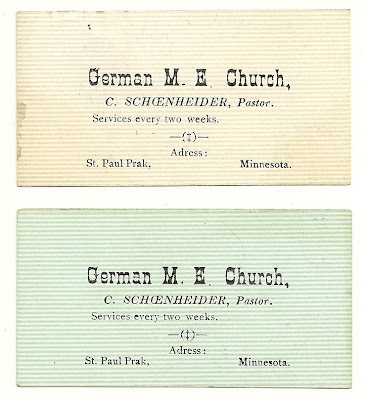 Brief online research shows that this may be Charles Rudolph Schoenheider, born in Minnesota in 1868, the son of clergyman Karl August Gottleib Neuport and Elizabeth (Veith) Schoenheider, both German immigrants. 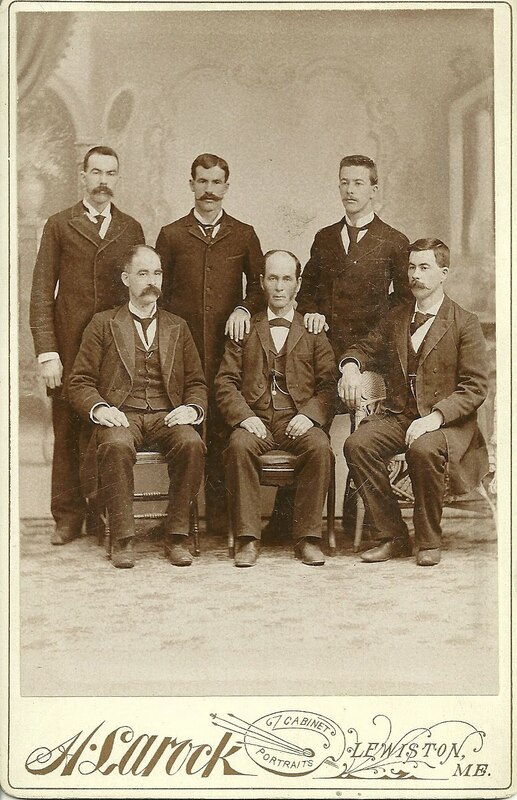 Charles married Meta L. Rolfing, who was born in Minnesota in 1882, the daughter of John and Caroline (Niemeyer) Rolfing. Charles and Meta married sometime after the 1900 Census and had 4 children together. He died in 1933, and she died in 1956. 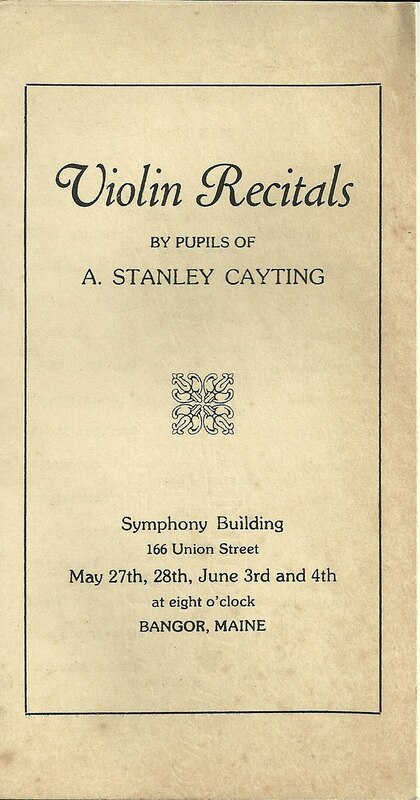 Undated program for several days of Violin Recitals given by pupils of A. Stanley Cayting. 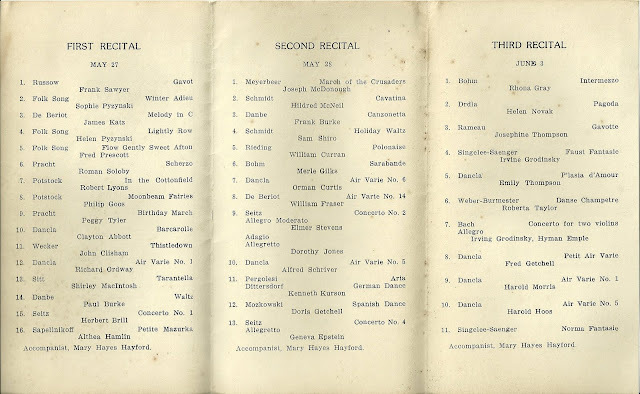 The recitals were held at the Symphony Building, 166 Union Street, May 27 and 28 and June 3 and 4, at 8 o'clock, at Bangor, Maine. I looked online for a birth date for one of the students - Fernald Richards - and found he was born in 1901. 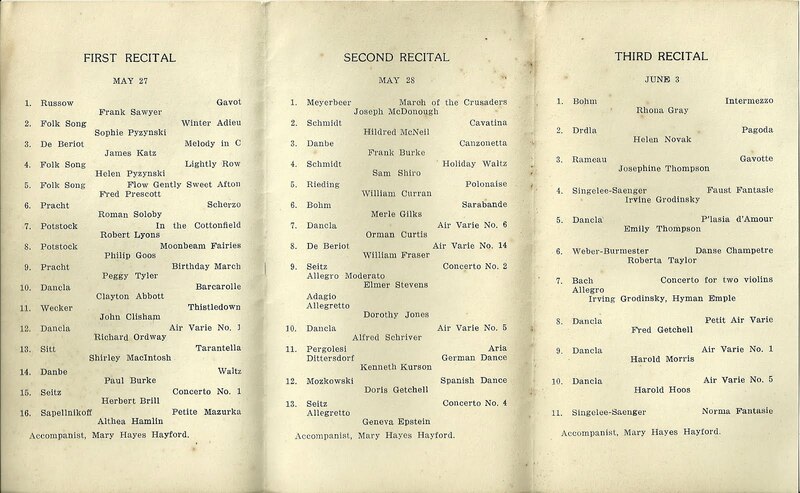 I'm guessing the recitals took place around the 1930s. 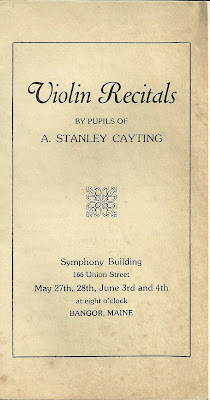 I found A. Stanley Cayting at Bangor in 1910 and 1930. 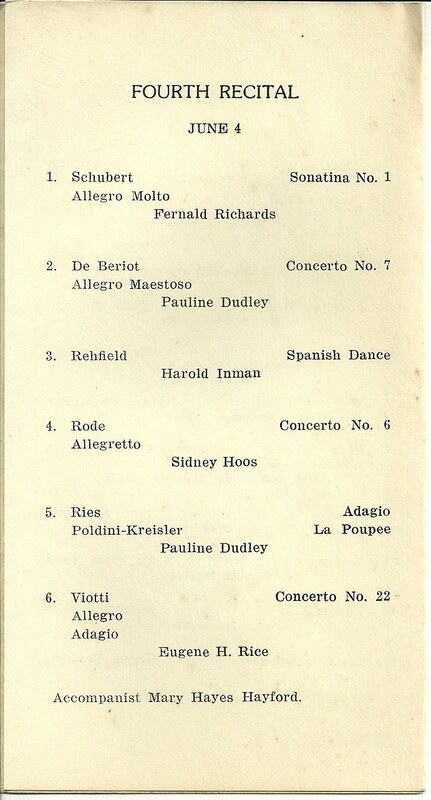 He appears to have been in Manhattan for the 1920 Census, perhaps at a music academy. 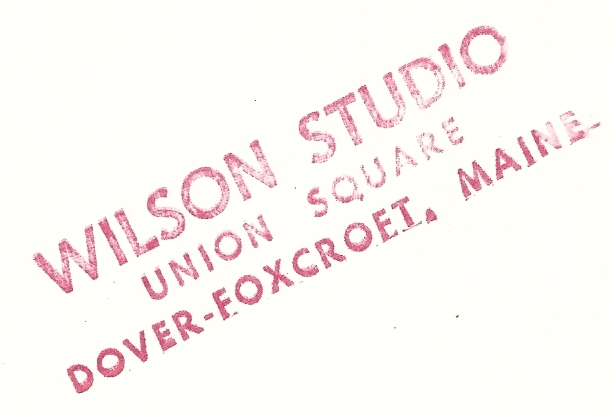 On the 1930 Census, he indicated he was a musician with his own studio. It's amazing to think that Bangor once had a violin school of this magnitude! Hopefully this memento will hold some significance for you - thanks for stopping by! 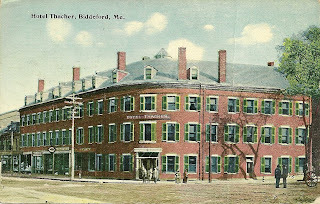 Postcard with a postmark of Port & Bos RPO, August 11, 1916 showing the Hotel Thacher in Biddeford, Maine. 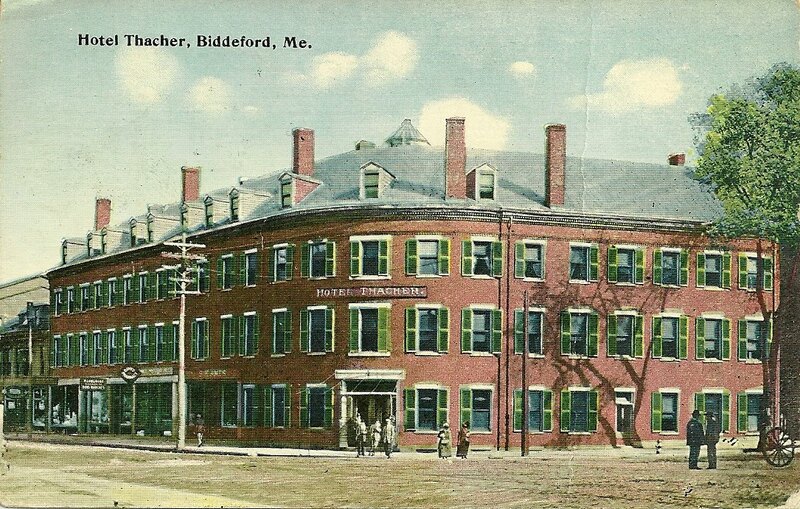 Reverse has a message from L. B. Sanders (probably Lillie B. Sanders of Warren, Rhode Island) addressed to Miss Rachel Place, State Street, Warren, Rhode Island: Don't look for us here as we are not stopping at this hotel, but at the "Hotel Greene". Have been having pleasant weather up to the last two days, which have been cold and some rain. L. B Sanders". Hopefully this memento will have significance for you. Thanks for stopping by! 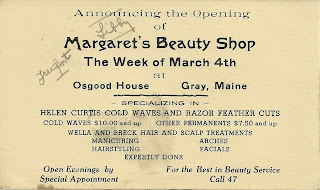 Box Holder card: "Announcing the Opening of Margaret's Beauty Shop The Week of March 4th, at Osgood House, Gray, Maine. Specializing in Helen Curtis Cold Waves and Razor Feather Cuts, Cold Waves $10.00 and up; Other Permanents $7.50 and up; Wella and Breck Hair and Scalp Treatments; Manicuring; Arches; Hairstyling; Facials; Expertly Done. Open Evenings by Special Appointment. 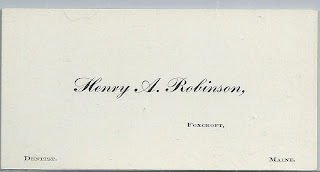 For the Best in Beauty Service, Call 47"
There are two handwritten words on the card: "Freeport" and "Libby". 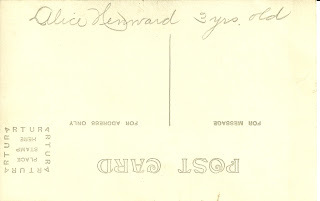 The reverse of the card has a postmark; I believe the date is February 26, 1946; the last digit is a bit cut off, but I believe it's a 6. Perhaps this memento will have some significance for you. Thanks for stopping by!